Balbir Singh has struck the proverbial pot of gold at the end of the tunnel. The Tavua lad rose from the poverty of his family, overcame social rejections and education hardship to graduate today. Mr Singh, 22, was among the University of the South Pacific’s gold medallists honoured on Wednesday night in a special ceremony. He was awarded the most outstanding Tourism Studies graduate – an achievement he deserved through hard work and perseverance. He will join hundreds of students who will graduate today. His parents who are sugarcane labourers in Balata, Tavua, will watch him graduate at the Vodafone Arena, Suva. Mr Singh’s journey started when he was a young boy growing up in a poor family supported by the Social Welfare Department. “I grew up in a family full of struggles and I did not know how to read and write until Form Three. I was also declared to be a mentally incapable student by some teachers,” Mr Singh recalled. He continued to beat the odds, kept whatever he could save and continued to look for doors of opportunities. “I came to realise the depth of poverty my family was in. I continued to work hard. I learned some English from English movies and most of the time I used to come last in my class. “I continued to study hard and came first in Form Three in 2004. In 2011, Tavua College honoured me with the Best Student Award in Computer Studies and Economics,” he said. Mr Singh was accepted to study at the University of the South Pacific but his application for scholarship was rejected. He did not stop there. He asked the Prime Minister Voreqe Bainimarama for help. “I will forever feel indebted to Mr Bainimarama for understanding my situation. He is God-sent because he is a leader who looks after people like us,” Mr Singh said. 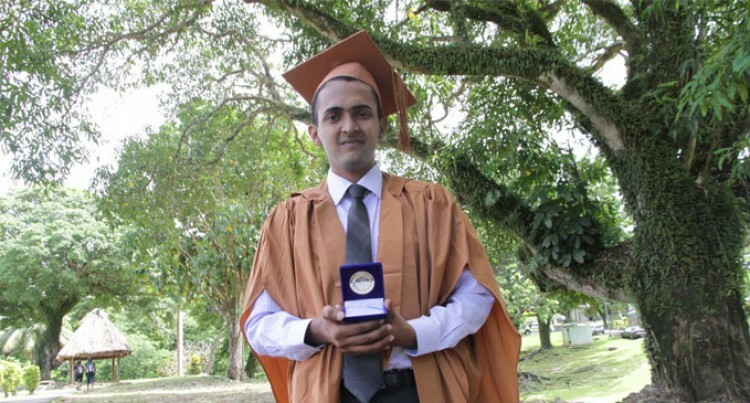 “In 2012, I entered USP with nothing, but the blessing of two people, my mum and the PM. No one trusted, believed and motivated me, but the persons who did love me were my mother and the Prime Minister Voreqe Bainimarama who awarded me a PSC scholarship.